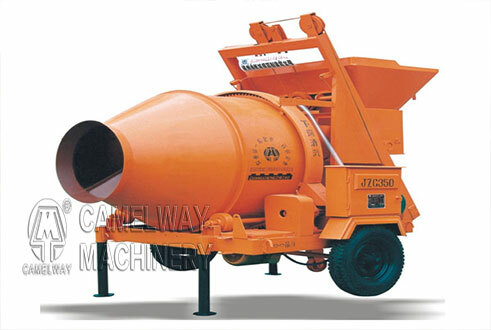 Drum concrete mixer is belonging to civilian concrete mixer and it is easy to be cleaned. After work of every day, you should turn off the power, and then clean the mixing drum. In the cleaning process, you should hang a sign that reads “No Switching On” to prevent someone restarting the concrete mixer. For safety’s sake, it is better to clean the concrete mixer by two operators to avoid accidents. When cleaning forced type concrete mixer, you should pay special attention to the mixing blades and shaft ends of single or twin shaft concrete mixer. You can’t hit the dry cement hard with flat shovel; otherwise there may be seal problems. It is difficult to eliminate the dry cement, so we can dissolve them with chemicals. Of course, we should clean it well to not affect the next use. Zhengzhou CamelWay Machinery manufacture produces tower cranes, construction elevators, concrete mixing stations, JS concrete mixers, concrete batching machines, stabilized soil mixing stations, wheel loaders, concrete transport tanks, JZC concrete mixers and other construction machinery. If you are interested in our products or want to know more information, please leave your contact way, for example, name, nation, and your contact way (email, or phone number, whatsapp, skype, viber, wechat). We will give you a reply as soon as possible.